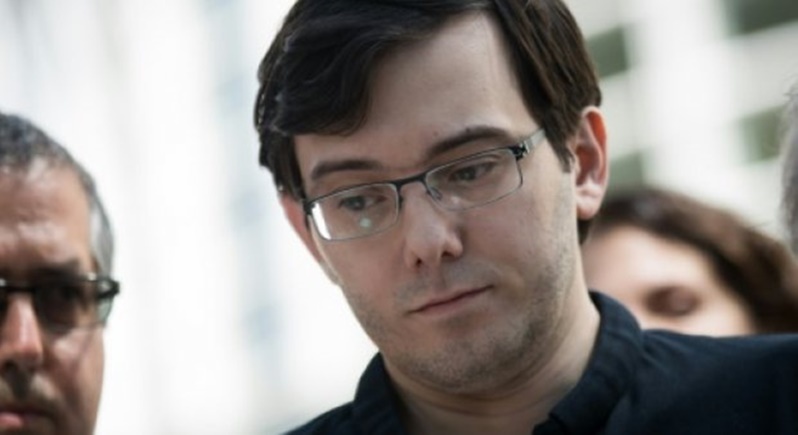 UNITED STATES: Martin Shkreli, once dubbed the most hated man in America for ratcheting up the price of an HIV drug, was sentenced to seven years in prison yesterday (Mar 9) on charges of defrauding investors. The disgraced former pharmaceutical executive and hedge fund manager was convicted in August last year of conspiracy to commit securities fraud and two counts of securities fraud. Shkreli, who once led Turing Pharmaceuticals, became known as “Pharma Bro” and is infamous for suddenly raising the price of the drug Daraprim in 2015 by 5,000% – from US$13.50 (B422) a pill to $750 (B23,483). He smirked through a congressional hearing that scrutinised his actions and has since earned a reputation for an extravagant, self-publicising lifestyle. Although the drug controversy had nothing to do with his trial before a federal court in New York, so great was the 34-year-old’s notoriety that it was initially difficult to find an impartial jury for the trial. Arrested in December 2015, his bail was revoked in September after he offered a reward for anyone who would grab a strand of former presidential candidate Hillary Clinton’s hair. Shkreli insisted it was a joke. His high-profile lawyer, Ben Brafman, described Shkreli as a mildly autistic, self-taught genius and asked US District Judge Kiyo Matsumoto to limit the prison sentence to a maximum of 18 months. But even Brafman acknowledged “there are times when I want to punch him in the face” because his client’s behaviour complicated the defence, according to reporters who were in the courtroom. Prosecutors were seeking 15 years’ prison, arguing that Shkreli showed no remorse for his actions and pointing to his provocative and bizarre statements posted on social media. “He wants everyone to believe he is a genius, a whiz kid, a self-taught biotech wonder,” said prosecutor Jacquelyn Kasulis. In a letter sent last week to the judge, Shkreli pleaded for leniency and for the first time admitted he had erred. “I made serious mistakes but I still believe that I am a good person with much potential. I was a fool,” he said, expressing a wish to work “for the betterment of humanity”. With a choking voice, he reiterated in court his remorse at the “shameful actions” that led to his downfall. On top of six months of good behaviour already spent behind bars, and after charity donations he made before his arrest, the repentance helped to lower his sentence far below what the prosecution requested. Last Monday (Mar5), Matsumoto ordered Shkreli to pay back $7.36 million (B230.44mn) to federal authorities, an amount they can recover by seizing his assets. These include a Picasso painting and his unique copy of an album by rappers Wu-Tang Clan. In 2015, he purchased for US$2mn (B62.62mn) the sole edition of the ensemble’s “Once Upon a Time in Shaolin”, which he put up for sale on eBay in September – while also threatening to “break this album in frustration”. The winning bid was a little more than US$1mn (B31.31mn) but by then Shkreli was already in jail after his bail revocation, throwing the deal in doubt. Shkreli had been convicted of securities fraud and conspiracy a month earlier. The jury, however, cleared him of more than half the charges for allegedly stealing US$11mn (B344.24mn) in stock from his first pharmaceutical company Retrophin to pay off investors who lost money in two of his hedge funds. The verdict left Brafman suggesting that Shkreli might even avoid jail time. Sounds like a perfect candidate for Trump's cabinet.